The University of Virginia’s spring break ended Monday. 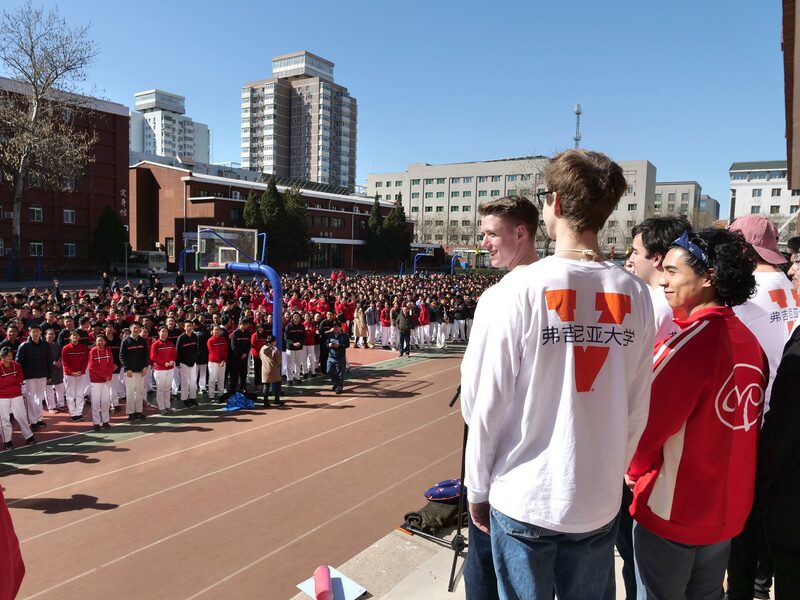 While thousands of students participated in UVA’s service-oriented Alternative Spring Break, hit the beaches or visited with family, a clutch of crooners headed to China for a whirlwind singing tour capped by a performance at the Great Wall, the world’s largest military structure. The humorously named Academical Village People headed east for a capella performances in Beijing, Shanghai and Guangzhou from March 8 to 17, performing at high schools and universities, on Chinese national television and at the U.S. consulate in Guangzhou. The singers performed in front of hundreds of middle and high school students at an academy in Beijing. Their journey began almost exactly one year ago, when an Academical Village People alumnus named Mike Ludwick returned to Grounds for the March 17 celebration of the singing troupe’s 25th anniversary. Ludwick has lived in China for years and has become a well-known television star there, singing on several talent shows, annual galas and television dramas. He told the current members, “You guys should come over. If you come to China, I’ll, like, plan a tour for all of you,” said Myles Stremick, a former president of Academical Village People, or “AVP” for short. “We’re like, ‘OK, there is no way we will actually go to China, but if we do, like, great. Thanks, Mike,’” said Stremick, who has a funny flair for the dramatic. But Kiran Menon’s ears perked up. As AVP’s determined business manager, he went to UVA’s vice provost for global affairs, Stephen Mull, to see how the singers could pull off the China trip. “I ended up striking gold with the support from the vice provost, Steven Mull,” he said. Before he knew it, Mull had kicked in some support, as had the Parents Fund and Air China. And before they knew it, 15 members of AVP were packing their bags and heading for their first destination: Beijing. In all, Stremick estimates the all-male group gave about 15 formal performances in China. One, of course, was at the Great Wall. It was there the singers joined Ludwick to perform for a documentary about Ludwick that Chinese television conglomerate CCTV was filming. They performed just three songs, but the taping took an hour. “The TV crew needed to get a ton of different angles, so we would have to do it once, and then we would have to move and do it again,” Stremick said. They sang “Lost in Japan,” by Shawn Mendes and Zedd; “If You Leave Me Now,” by Charlie Puth and Boys to Men; and “Kiss Goodbye,” by a Chinese artist named Wang Leehom. There were also several impromptu performances, one of which Menon remembers with great fondness. “I think the moment I will remember most is when we went to this public park that was near the Temple of Heaven” in central Beijing, he said. There were about 100 elderly Chinese men, and in a funny moment the singers decided to challenge them to do push-ups and sit-ups. Afterward, the UVA guys began singing a popular traditional Chinese song called “Yue Liang Dai Biao Wo De Xin” [“The Moon Represents My Heart”] they’d learned in advance on Ludwick’s recommendation. “This crowd kind of formed around us and as soon as we went into the lyrics, everyone kind of started singing along and there were a couple of people tearing up and getting emotional,” Menon recalled. “I think that’s the moment that I’ll remember the most, about how meaningful it was to see from the Chinese perspective to see Westerners engaging in in their culture in a way that really I guess most of them had never seen before,” he said. The group also visited Tsinghua University, where there is a rotunda believed to have been designed by Yan Huiqing, UVA’s first Chinese graduate. Stremick and Menon said they are incredibly grateful for the support they received from the University. In all, it was an action-packed visit. Singer Zack Liga was so pooped when he got back to UVA that he slept for 20 hours straight.